Before the update, I had my lock screen disabled so all I had to do was press the button and my phone came up to the home screen. Now I have to swipe unlock every time and I think I have it set for that not to be that way. Is this just some bug with kitkat? It's very annoying! No your not seeing a bug or anything, this was changed in the update to KitKat. I think it ranks in the top 3 most commented changes in the update. oh man, those hosers, I wonder why they removed all those lock screen choices. Argh. it will shoot to #1 once the rest of the carriers get their updates. wait. i just updated on tmo and now i have to swipe to unlock my screen? i came here to find out how to disable it. i can't? srsly?? is there an app that will disable it? sorry, i am new to android. and this is sucky. There are apps to disable swipe to unlock in play store. My screen lock is set to NONE as well but after update I now need to swipe to unlock. just tried NO LOCK SCREEN to no avail. anyone have another solution? this may be the reason to switch to iphone. this is my first android. and i've never had an iphone (came from blackberry). as a photographer, every second counts. no, pictures from my phone aren't THAT important. but having to swipe in addition to waking the screen only means lost seconds and therefore lost shots. BONUS QUESTION/COMPLAINT: i noticed that the lock screen is showing my local time and weather, but that the weather is not updated. i can't tell if it updates on it's own at certain intervals or only when i actually check the weather app. does anyone know how to control this so that the lock screen i don't want is at least somewhat useful? ALSO, how do i change the icons that are at the bottom of the lock screen i don't want? thank you!!! Hari Uday, TWC42, Rasmus Jensen1 and 5 others like this. Nolock works great on my Sprint HTC One. I have been using a custom lock screen via Widget Locker and since the KitKat update the two separate lock screens were battling with each other. Often if would have to swipe both screens to use my phone. Nolock has disabled the default lock screen without messing with the custom one. Thank You! Cant thank enough! i believe it did the same thing for me after a reboot. however, after you enter your password once you will not have to reboot or swipe to unlock until the next restart. the reason i can't recall is that i uninstalled no lock after a few days as it seemed to affect other things adversely. if anyone knows of another option, please share. Hi, I have the Note3, I have this annoying lock and can't disable it. I tried "no lock ".. did not work. Anyone with a Note3 having this problem? It's not just the Note3. I believe everyone with KitKat has this annoying problem. I haven't updated yet and this is one of the reasons why. Pisses me off too, use this app. One click and it's gone. So easy! Golfdriver97 and Klevah like this. I had this problem as well. I never used screen lock. I updated to Kit Kat (which I hate). Then a while later, I turned on screen lock temporarily. When I attempted to turn screen lock off again, I was unable to select the "None" option. I tried the No Lock app suggested by Whitney Ingram above, which mostly works, but it froze my Nexus 5 several times in a span of two days, forcing a reboot each time. Finally, as Adryan Adrian suggested above, I tried removing the security credentials via Settings/Security/Clear credentials and then the "None" option for screen lock was enabled again. I don't know exactly what credentials it cleared, but so far it didn't break anything. Samsung Galaxy S4 Keyboard can't remember added/new words!!! Newbie stylus user: screen protector or not? 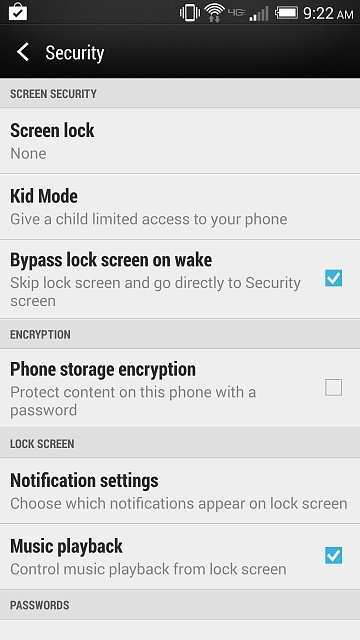 How to add widgets to Galaxy Note 3 lock screen? Please Give Me Advice On This 8-Hour First Charge Situation.